Simply incredible: Handsome brickiness to the rim, like a little gray at the temples. Lovely deep ripe cherry scent, wearing a thin but elegant veil of oak.Â Still lively and optimistic, but with a tinge of worldliness hard-won in the cellar.Â Silky. Dark cherry, raspberry, and ripe plum flavors that have the depth of a well — you drop in a penny and it seems to fall forever. And when it sounds bottom, that gently reverberating echo you hear is the oak and acid, somehow defining the structure with no physical presence at all. Most bewitching of all, the hard, cinnamon taste of (I’m guessing) ripe pinot stems, evoking the character of the plant, the site, the hillside in late harvest, sun-baked, orange and russet. Itâ€™s the taste of a decade past, that 1999 harvest that came out of nowhere and seemed to last forever. 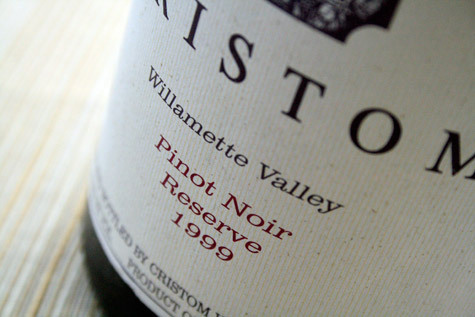 Complete and beautiful, an archetype of Oregon pinot: a little wild and brambly, but pure, authentic fruit. Transcendent. Like and old friend; like Oregon. 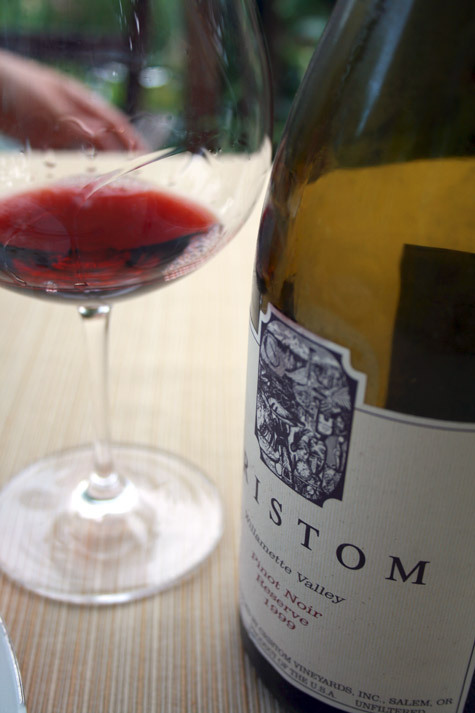 James and I did an article on Steve Doerner, Cristom’s soft-spoken but incredibly talented winemaker, nearly a decade ago. One of his predilections is adding whole clusters to the fermenter, something you don’t do casually because unripe stems can highjack a wine and send it into the vegetable patch. But late in the season, if grapes are still hanging, the stems dessicate to a rich, warm brown and their flavor turns toward cinnamon. I can’t say for sure, but it sure tastes like whole clusters must have played a role in this wine, and that’s in part what makes it so complex and evocative. The harvest in 1999 was long enough that Steve would indeed have had ripe stems at his disposal, and the resulting wine has those distinctive spice notes. In short, stunning. 106 points, you Calipalate critic bastards.